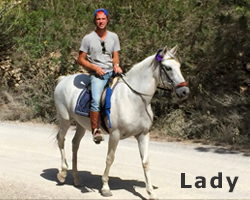 Very beautiful Lusitano mare, gentle and sensitive; she loves cuddling. For many years she was my lead horse and not ridden by anybody but me. 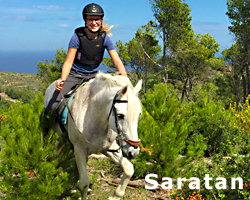 She needs a relaxed and experienced rider with confidence. Born in 1995 she is not a youngster anymore, still she is spirited and happy to work. She carries riders of maximum 70 kg. Menorquin gelding with a lot of personality. He equally takes care of beginners or advanced riders. He is the strong one in the group, for this reason he mostly carries our male guests. Moll's favourite activity is snacking. To get a little something on the road he becomes very inventive and cheeky but never vicious. He always takes good care of his riders. He was born in 1999. The maximum weight he carries is 85 kg to 90 kg. Hispano-Arabic gelding, he takes his job, showing the North to experienced and inexperienced riders, also children, very seriously and enjoys it. He is my best assistant and is almost inseparable from Lady. The love for food and snacks he shares with Moll. Saratan is the oldest of my herd and already was born in 1992. He tends to believe he knows more than his riders and often is right about that. He carries riders up to 65 kg. Spanish/Asturian big pony or small horse. A very charming and a little opinionated mare. Relaxed, inquisitive and trusting. She is at the very beginning of her carrier. 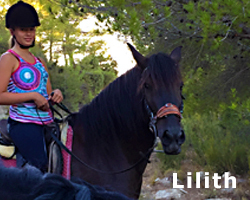 Lilith is still learning and only available to very experienced riders at this moment. She joined us to support Lady and Saratan as they are getting older. Born in 2007, she is the youngest of the group. For riders of maximum 65 kg to 70 kg. Pura Raza Española, born around 2002, a very special girl with a lot of character. When she came to me in 2016, she was traumatized and not easy to work with. Bit by bit she has learned to trust and be a reasonable horse again. First tries with guests are going great. Tellya enjoys the undivided attention of people, eg. when cleaning. She is a real sweetheart and cuddly. For a good, and sensitive horsewoman, it is a pleasure to ride her. Maximum weight 70-75 kg. 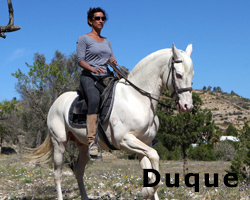 Absolutely unique Lusitano stallion. Mostly very gentle and sweet. 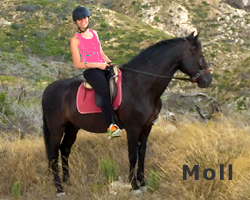 After he was not too friendly to humans and horses in his previous life, now he is living happily with his friend Moll, who teaches him how to enjoy life. He works as lead horse. He was born in 2005. Generally only I ride him.